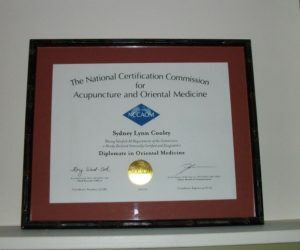 (the highest certification) by the National Certification Commission for Acupuncture and Oriental Medicine. 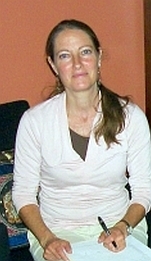 She holds a Master’s Degree from the East West College of Natural Medicine in Sarasota Florida. She completed a 5 academic year program there with 2908 hours of education including well over 800 hours of clinical practice. Sydney’s practice is located at 801 Florida Rd, Suite 12, in Durango Colorado where she specializes in Acupuncture and Chinese Medicine. Sydney integrates a number of healing modalities in her practice including… auricular (ear acupuncture) therapy, moxabustion, cupping, homeopathy, herbal and nutritional supplements. Sydney views her relationship with her clients as a partnership and she believes in empowering them through lifestyle education and participation in their healing process. Before becoming a Chinese medicine practitioner and Acupuncturist, Sydney worked as a researcher for the Colorado Division of Criminal Justice. Before that she worked with emotionally disturbed adolescents in a shelter setting. After years of studying people who had trouble living in a healthy way, she became inspired to help people heal through a powerful holistic medicine system. Sydney provides time for the Durango Acupuncture Alliance, which is a group of independent, professionally licensed and nationally certified acupuncturists… who have joined together to offer their skills and the many benefits of Chinese Medicine to our community. The Veterans clinic is open on Mondays from 4-6 at the Riverfront Building, 128 W. 14th St, Suite 2A. Sydney specializes in Women’s health.